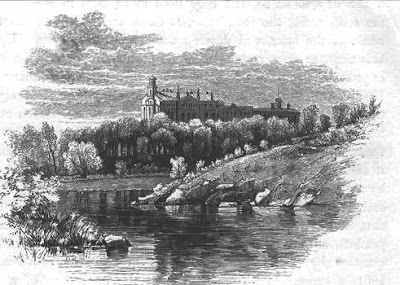 When Frederick Law Olmsted and Calvert Vaux won the commission to design Central Park in 1857, the northernmost area from 106th to 110th Street was not part of the project. In 1868 the additional 65 acres of land, which was mostly marshland, was acquired and the park extended. The architects initially planned a formal promenade with a canal but decided instead on a lake with a natural-appearing wandering shoreline. Using the Dutch word for lake, they called it the Meer. 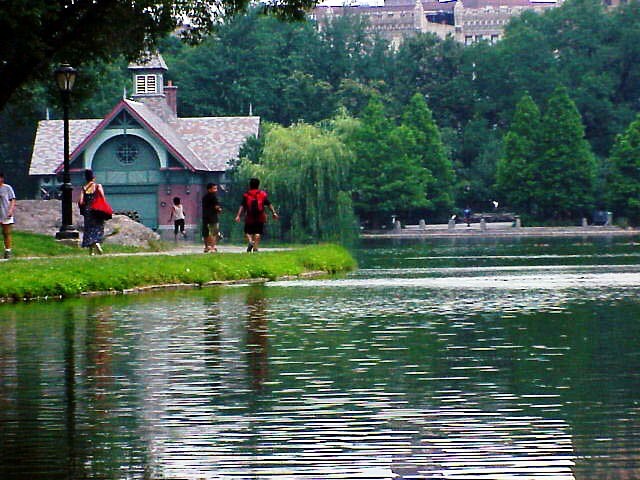 The 11-acre artificial lake, the bottom of which was lined with concrete out of the public’s fear of malaria, was a popular picnic spot in the northern park’s rugged terrain. In 1941 Parks Commissioner Robert Moses redesigned the Meer, replacing its naturalistic shoreline with a concrete rim. The Meer was soon fenced in under Moses’ direction and two playgrounds installed. As part of his renovation, the commissioner had a long, one-story boathouse constructed in 1947. 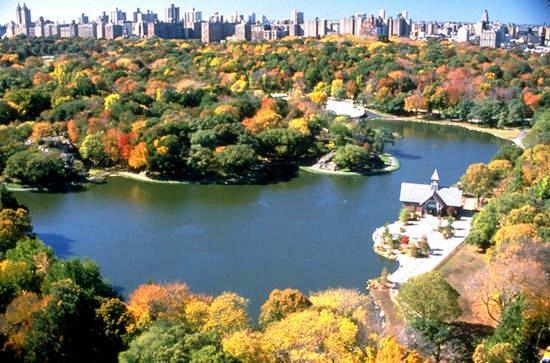 New York Magazine reported in November 1986 that Parks Commissioner Henry Stern and the Central Park Conservancy had developed a plan to rebuild a new boathouse near the site of the now-abandoned one. 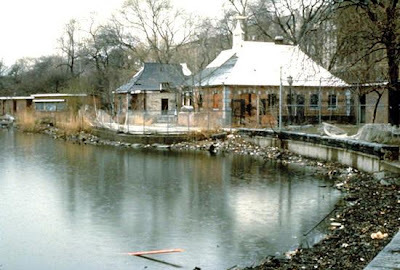 In August 1987 the City approved a proposal from a partnership of Harlem real estate investors and a Harlem restaurant operator to rebuild the boathouse as a restaurant. Architects Buttrick White & Burtis were given the commission to design the $5 million project. 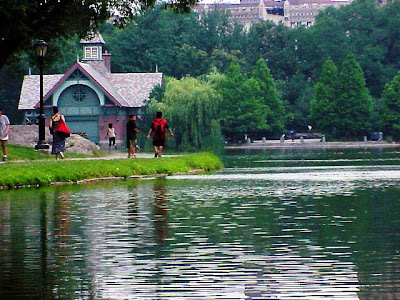 The Central Park Conservancy, at the same time, dredged the Meer of 20,000 cubic yards of silt, removed truckloads of trash from the lake, and installed an aeration system. Robert Moses’ concrete rim was replaced with the naturalistic shoreline from Olmsted and Vaux’s design and thousands of fish were introduced to the lake. 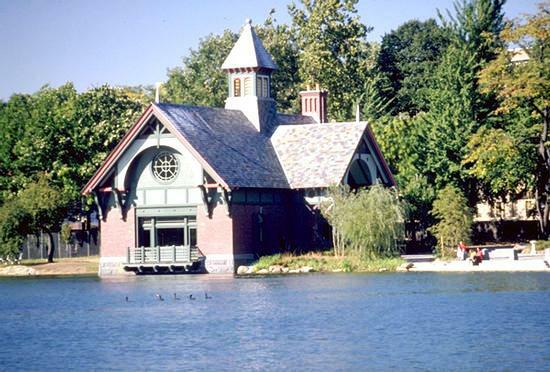 Buttrick White & Burtris produced a boathouse so sympathetic to the Victorian architecture of the park that few visitors would guess it is modern. Constructed of stone and brick with a slate tile roof, its fanciful gables and bell tower fit remarkably with the other structures in the park. Reopened in 1993, the Meer has a new artificial island similar to the one that was lost in the 1966 renovations and a “whimsical” sandy beach. Rather than housing a restaurant as was expected, the boathouse became the Charles Dana Discovery Center, where children learn about the environment and can participate in a free catch-and-release fishing program.